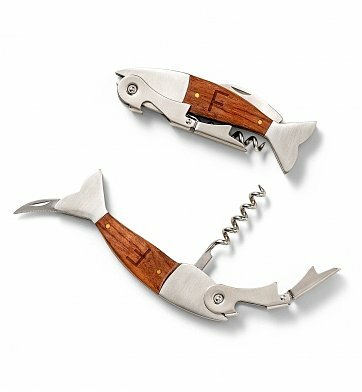 Perfect for the boat, the RV or the barbeque at the lake, this fish-shaped, heavy-duty stainless steel corkscrew and bottle opener features a foil-cutter and a solid wood grip. Engrave Dad's initial on the wooden handle and make it his very own. One Stainless Steel Double-Hinged Fish Corkscrew. One initial on the solid wood grip. Enter information to be engraved during the checkout phase of the ordering process. Engraved Corkscrew and Bottle Opener is a hand delivered gift. These gifts are delivered by one of our local design centers located throughout the United States and Canada. Same day delivery is available for most gifts when ordered before the cutoff time. The cutoff time for Engraved Corkscrew and Bottle Opener is 2 PM in the recipient's time zone. Heavy duty corkscrew and bottle opener made by Kikkerland. Complimentary engraving of one initial on solid wood grip handle.